Though white is not considered a color, it plays a critical role in any artistic composition. In a garden, it’s a design tool that you can use to create many different moods and styles, from crisp and modern to cottage garden casual. Here are some creative ways for using white in your flower garden. 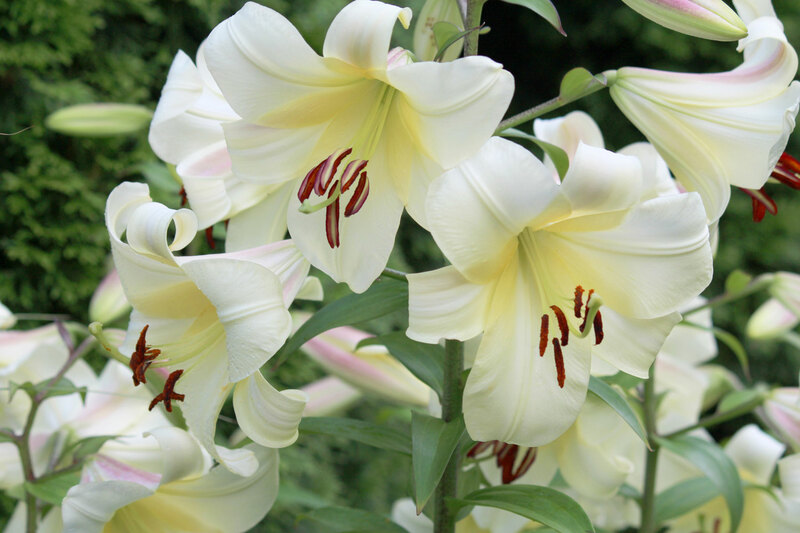 Flowers that we call “white” are rarely pure white. In most cases they are either cool whites (with tints of blue) or warm whites (with tints of yellow or pink). As you may imagine, it’s best to pair cool white flowers with cool colors and warm white flowers with warm colors. When you know which direction your white flowers lean, you can locate them for best effect. Keep in mind that white flowers reflect light, so their tint is influenced by whatever colors are nearby. The white garden at Sissinghurst Castle. In garden design, white can be used to influence how we feel in a certain space. It can make a garden look chic and elegant, quiet and calm, or cool and fresh. Here are a couple examples. Quiet and Calm. White flowers reflect light and dark colors absorb it. In the morning and evening when the light is low, white flowers seem to come toward us while dark colors recede. Their soft, moon-like glow is serene and it feels natural to slow down, listen and speak softly. A shady nook in the garden of Derry Watkins, Wiltshire, England. Cool and Fresh. 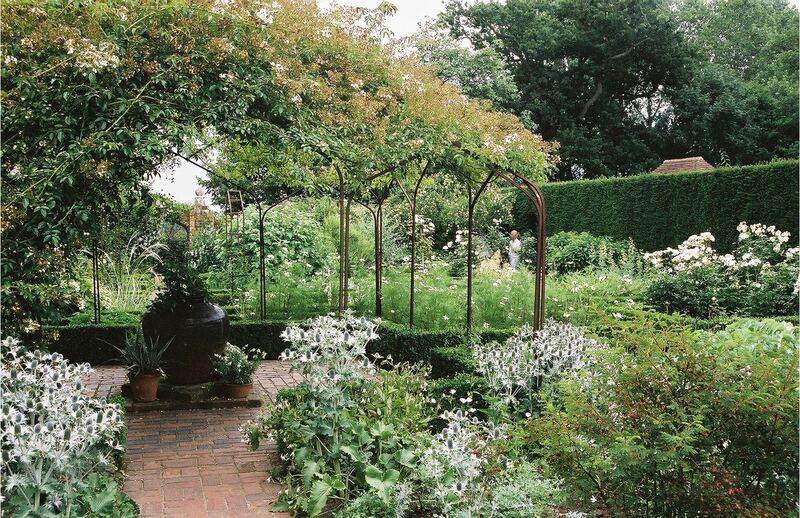 In hot climates, shady gardens provide a welcome escape from the heat. White flowers can be used to accentuate this feeling of coolness. 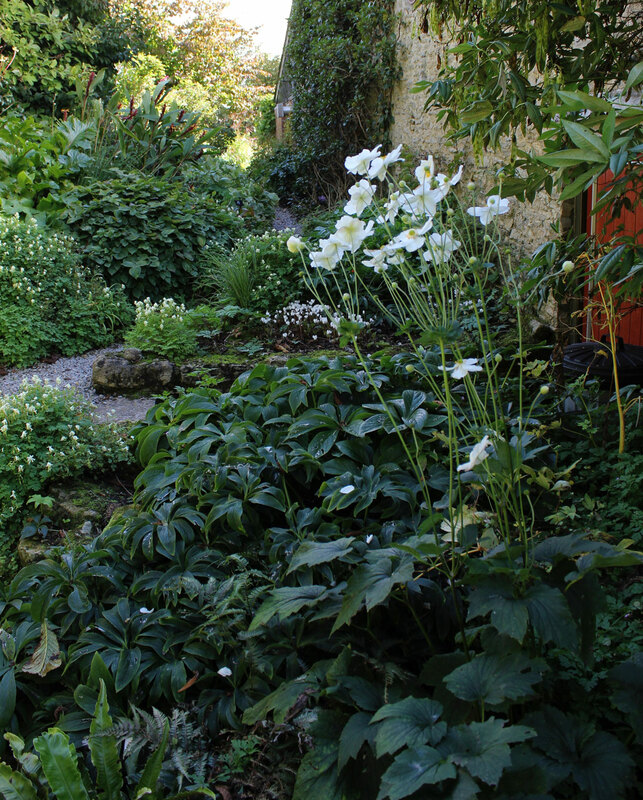 A shady garden also makes it easier to appreciate the textural variations in foliage and flowers. 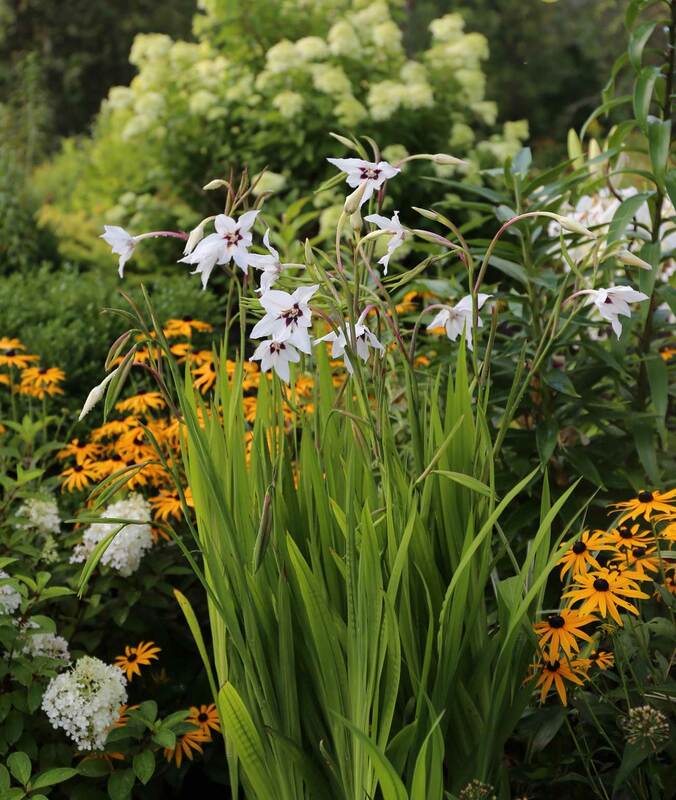 Consider the smoothness of hosta leaves, the papery petals of clematis or the waxy flowers of an Oriental lily. 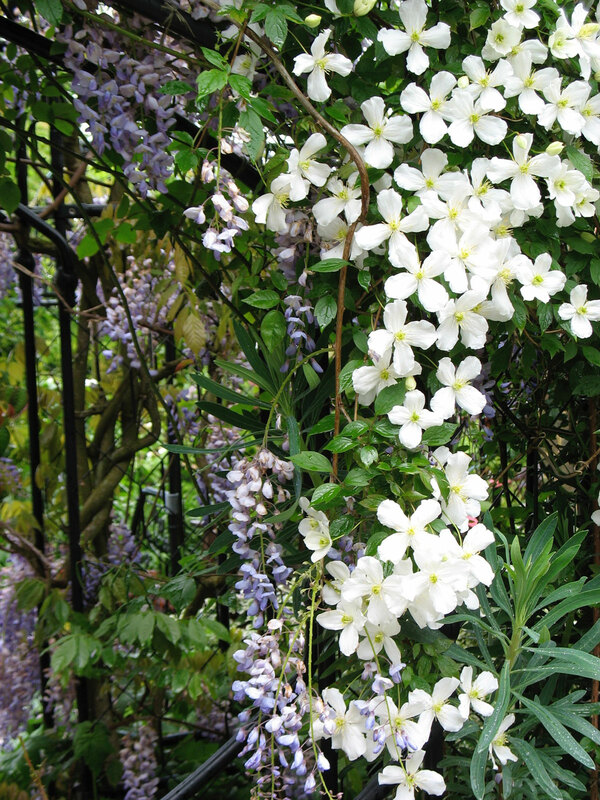 Clematis montana alba growing with wisteria. Chic and Elegant. White can also be upscale and refined, like a crisp linen shirt or a simple strand of pearls. There’s a classic, timeless quality to white flowers and they tend to look more sophisticated than their rainbow-colored relatives. Hosting a summer wedding or evening soiree? White flowers are a must. 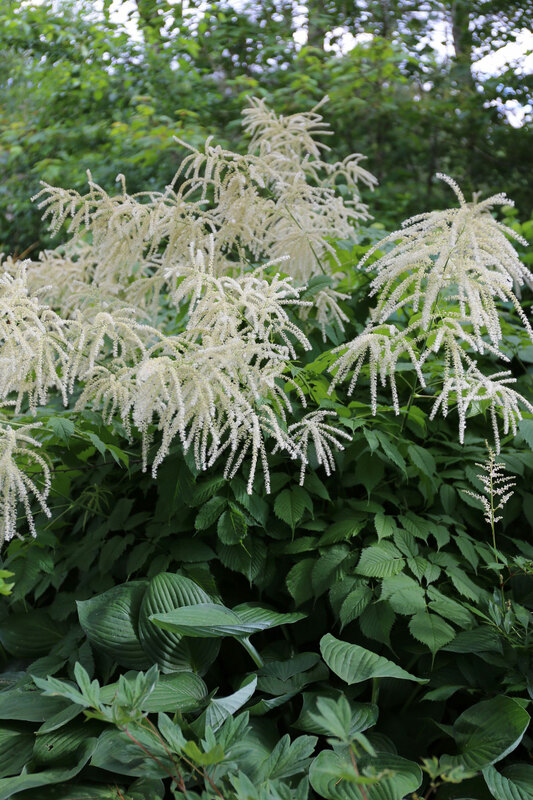 Aruncus, also known as goatsbeard. 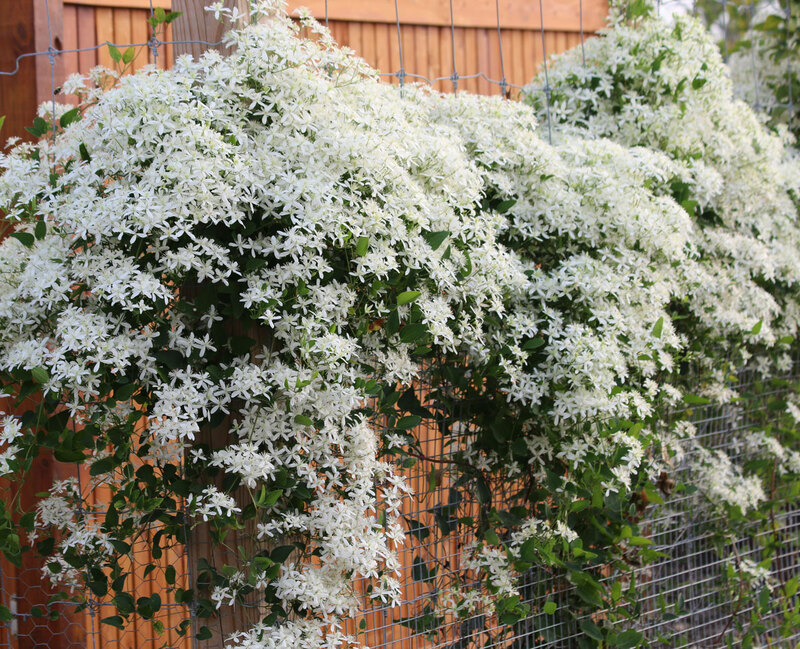 White flowers look their best when accompanied by foliage. It’s the contrast against a rich, green background that gives white flowers volume and a light, ethereal feeling. 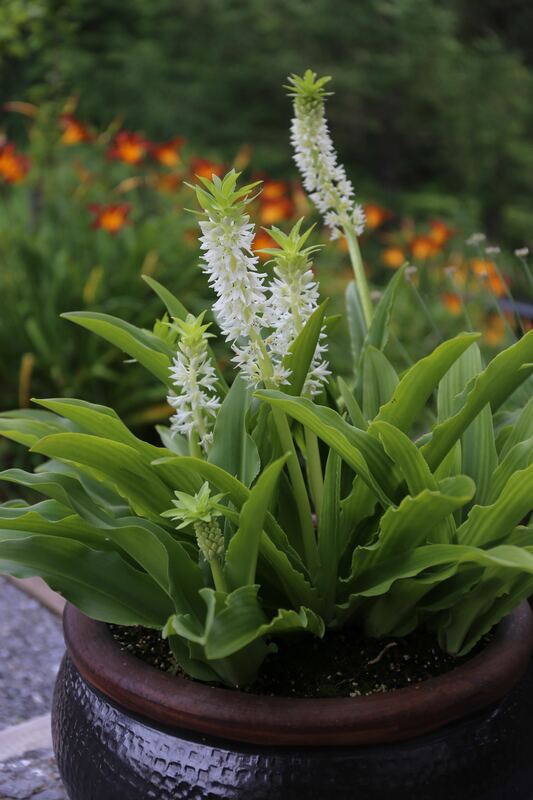 Pair cool white flowers with plants that have a blue cast, such as silvery artemisia, stachys and grey-blue hosta. 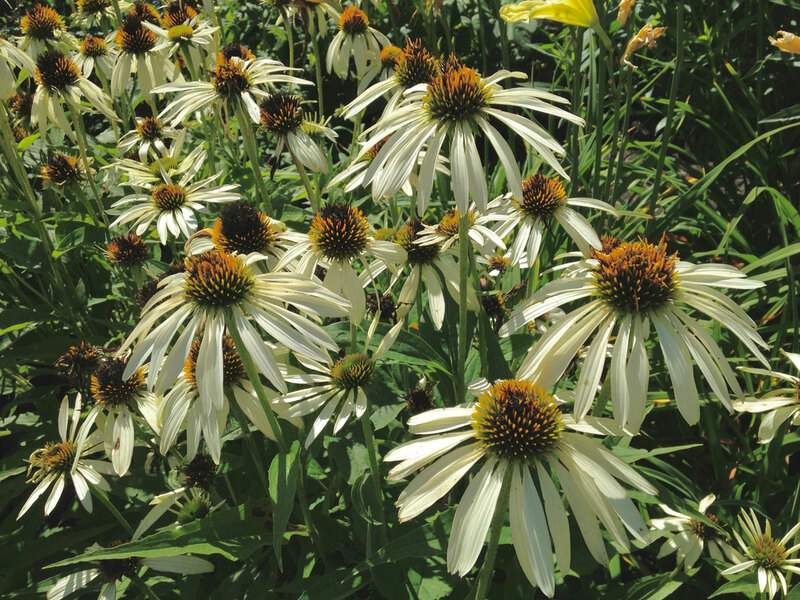 Greys and silvers tend to soften white flowers and help them blend rather than stand out. Creamy whites look better with warm olive or lime greens, such as alchemilla, euphorbia and hakonechloa. Foliage with bronze or brown tones is also a great companion for warm whites. 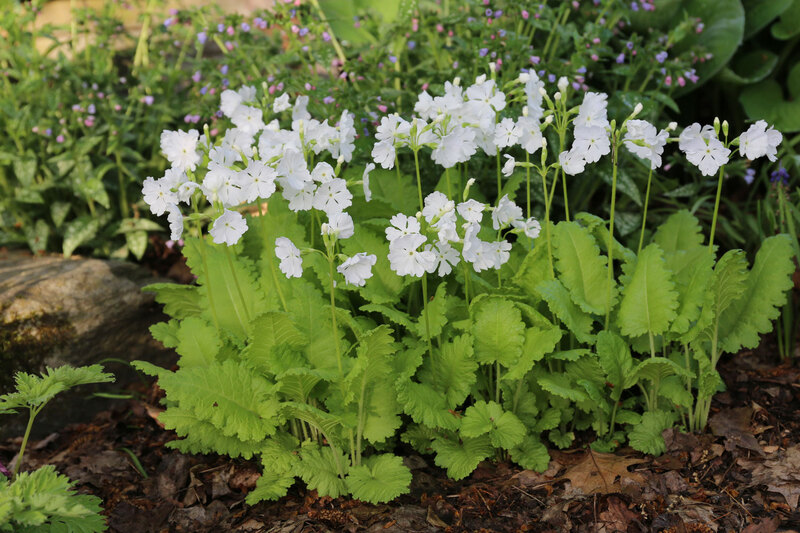 Consider heucheras, ajuga and rodgersia. 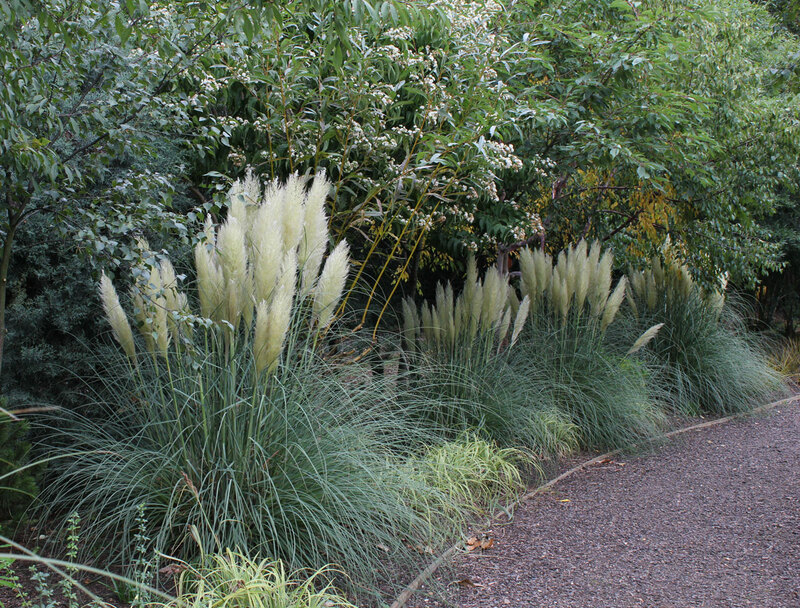 Grasses can be good companions for white flowers and help integrate them into the landscape. Consider grasses with variegated foliage such as Miscanthus sinensis ‘Morning Light’, Miscanthus sinensis ‘Cosmopolitan’ and Calamagrostis ‘Overdam’. Pampas grass in Bressingham Gardens, Norfork, England. White flowers are striking and grab our attention. This is why if you use too many of them, you can wind up with a garden that’s just as loud and unsettling as one that’s filled with reds and oranges. The best way to use white is judiciously: for creating pacing and rhythm, for emphasizing contrasts and to create interruptions. Remember to also work with the shapes of flowers and foliage, whether they are tall and spiky or soft and mounding. The goal should always be to create pleasing shapes in the landscape. The summer bulb Eucomis autumnalis. Another way to incorporate white is via garden structures and hardscaping. A white pergola or obelisk, a white garden bench or a section of white picket fence can help you carry the theme through your garden. There are many white flowers that look great in pots and planters. This also makes it easy to move them around wherever you need to inject a bit of cool and freshness. Good candidates for pots include: Pelargonium (white geraniums), Euphorbia ‘Diamond Frost’, petunias and Eucomis autumnalis. Acidanthera, commonly known as peacock lilies. The list below includes more than seventy annuals, perennials and bulbs with white flowers, plus two dozen shrubs and trees. Some of the species are only available in white. In other cases, you will want to seek out the white cultivars. Acidanthera, Allium Mt Everest, Allium nigrum, Alyssum, Amaryllis, Ammi majus, Baby’s breath (annual), Caladium, Calla, Camassia leichtlinii, Cleome Helen Campbell, Cosmos, Crocus, Daffodils, Dahlias, Datura. 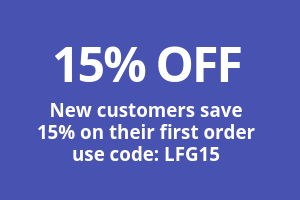 Eucomis autumnalis, Geranium (Pelargonium), Gladiolus, Hyacinths, Impatiens, Leucojum, Moonflower (Ipomoea violacea), Nicotiana alata, Petunias, Snowdrops, Stock, Sweet peas, Tulips, White lace flower (Orlaya grandiflora), Zinnias. Achillea, Actaea, Agapanthus, Anemone nemerosa, Arabis, Aruncus, Aster, Astilbe, Baby’s breath, Campanula, Candytuft (Iberis), Chamomile (Anthemis cupaniana), Centranthus valerian, Chrysanthemum, Crambe cordifolia, Creeping phlox (Phlox subulata). Peonies, Phlox paniculata, Primula, Salvia Victoria White, Sanguinaria (bloodroot), Shasta daisy ‘Becky’ (Leucanthemum), Solomon’s seal (Polygonatum odoratum ‘Variegatum’), Tiarella, Trillium, Veronicastrum. Amelanchier, Azalea, Buddleia, Cherry, Clematis, Clethra, Climbing hydrangea (hydrangea petiolaris), Climbing roses, Crab, Deutzia gracilis, Dogwood, Euonymus Emerald Gaiety, Fringe tree (Chionanthus), Hydrangeas, Lilac, Magnolia, Mock orange (Philadelphus), Pear, Rhododendron, Shrub roses, Snowberry, Spirea, Sweet autumn clematis., Viburnums, Wisteria floribunda Alba, Juniper Blue Star or Moonglow. To learn more about using color in your flower garden, you may be interested in reading: How to Use Burgundy in Your Flower Garden, How to Use Pink in Your Flower Garden and How to Use Orange in Your Flower Garden. What a fabulous gardening site!! And guidance with an artist’s eye! I look forward to the newsletters and hope that hardiness zone-specific information abounds. As a Mainer transplanted to the SF Bay area, I am longing for lilacs, peonies and violets to bring me “home”. 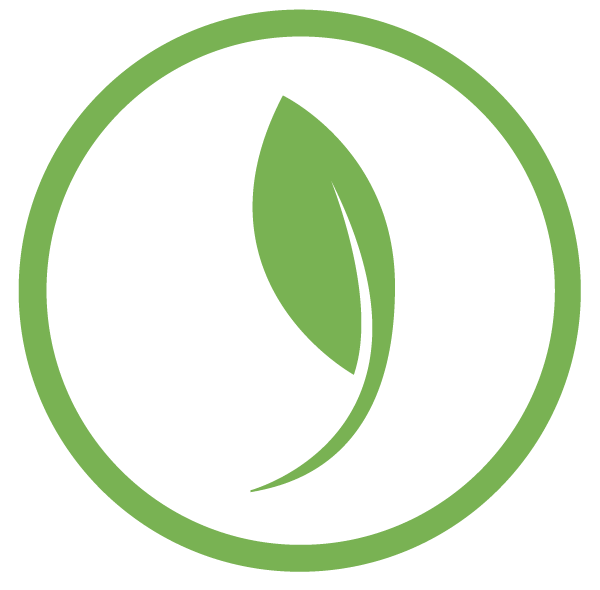 Thank you for a beyond-cultivar experience! Hi Michelle — Thank you for your comments. There’s nothing like early summer in New England. But what fun you will have experimenting with all those zone 7 and 8 plants! 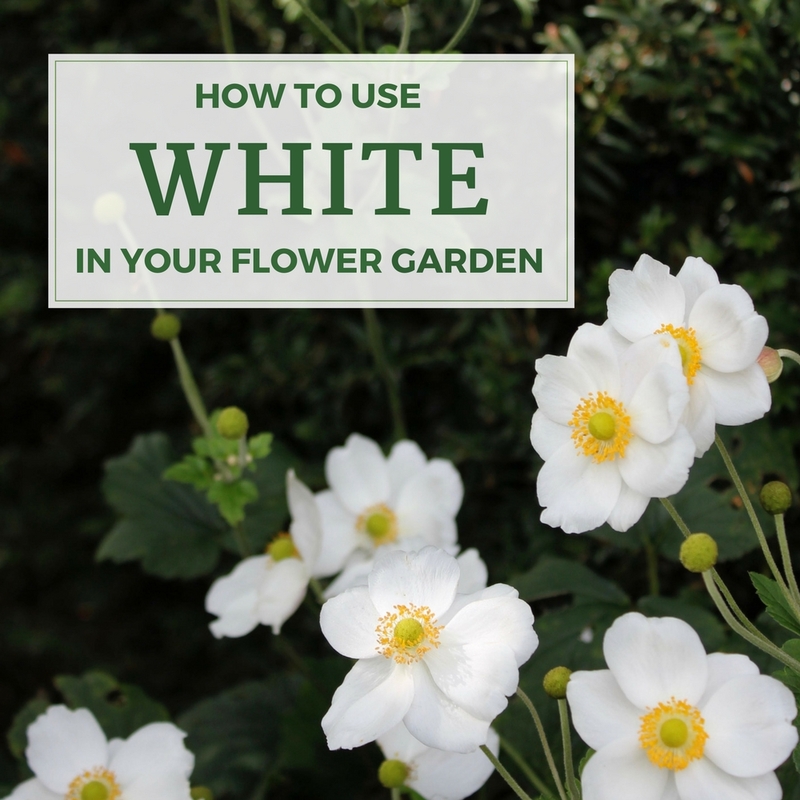 Thanks for sharing such a nice information about How to Use White in Your Flower Garden.